Happy Birthday to je parle américain! It’s hard to believe that je parle américain is celebrating its first birthday today. It seems like just yesterday (to me, at least) that I posted the headline that read “Big change of focus underway … if Julie Powell can do it, so can I.” Two days later, I published my first ever blogpost: “So what’s this all about?” where I announced that what had been the website for my stalled “English language consultancy” would henceforth be the online diary of this American in Paris, where I would recount for your entertainment my experiences as an expatriate in the City of Light. Well, since then, I’ve recounted a lot for you. I’ve complained quite a bit, of course; I’m pretty good at that. Surprisingly, it doesn’t seem to have bothered you much (with one or two notable exceptions). In fact, it seems that I get my biggest spikes in readership when I complain about, oh, I don’t know … the perpetual headache of French bureaucracy … or getting mistreated by Parisian waitstaff on the Fourth of July … or how filthy my neighborhood is. I want you to know, dear readers, that I sincerely appreciate your support and commiseration. When the burden of expatriate life gets you down, there’s nothing like a pat on the back from compatriots back across the ocean to make you feel better, or from fellow expats here in France to make you feel less alone. I write for je parle américain because it’s a creative outlet and because, sometimes, it’s therapeutic for me. It gives me an ego boost, too, to see that someone else out there finds what I have to say interesting. I admit, I check my readership stats almost every day. Every storyteller wants an audience, and what storyteller doesn’t want one that gets bigger and bigger and bigger? 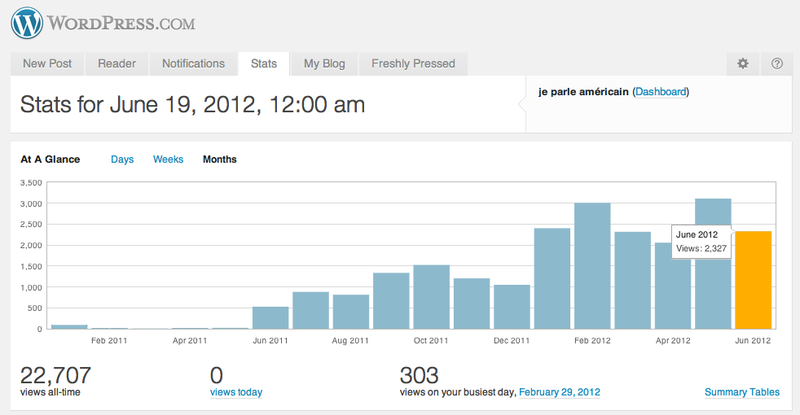 When je parle américain debuted last June 19, I was thrilled to get 500 views by the end of the month. Since then, readership has ballooned to an all-time high of 3,110 last month, and this month is on target to surpass that figure. That’s a trend I like! Of course, many folks stumble upon je parle américain while looking for something else (French actor Jean Reno seems to be the biggest inadvertent draw) but, sometimes, that’s how relationships start, right? Whether they got here by accident or invitation, I’m happy to say that je parle américain currently has 47 subscribers, 75 Twitter followers, 125 Facebook fans, and even 156 Facebook “friends.” It’s been great to see the bandwagon get bigger and bigger over the last twelve months, and I sincerely appreciate your coming along for the ride. Of course, there’s always more room onboard, so why not invite your friends to check it out? 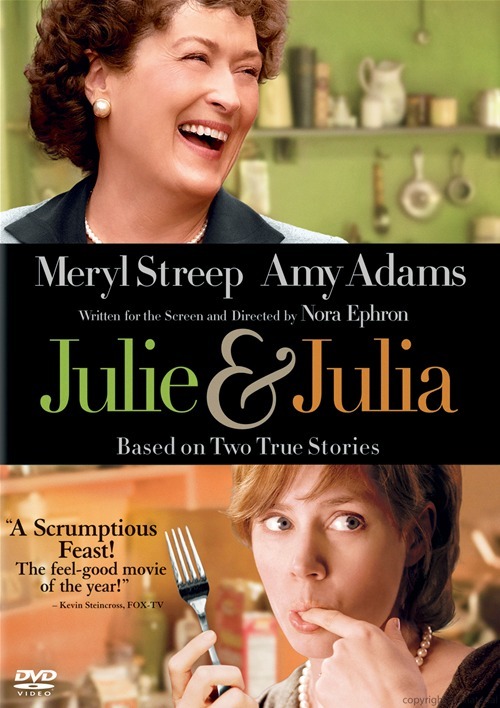 je parle américain might not be on the verge of getting published as a memoir or transformed into a feature film starring Meryl Streep (perhaps as my mother? ), but give it some time. I promise you’ll be the first to hear about it when the book deal gets signed! Happy birthday to your blog! Cheers and keep writing. Yes!!! You did very well indeed. I for one, would like to see this in book form. Who “would have thunk” that SOUTH CAROLINA and FRANCE have roots?!?! Your writings!! It has been fun to read especially while we lived here. your stuff outloud to my husband. We’d laugh & shake our heads over similar stories.